We offer compelling career opportunities for scientists, support staff and managers at all levels of our organisation. Our pioneering heritage of more than 900 hundred years of clinical and scientific excellence at Guy’s and St Thomas’ and King’s College Hospitals, has placed us at the heart of a dynamic and competitive marketplace, where new discoveries occur every day. That’s why we offer compelling career opportunities for scientists, support staff and managers at all levels of our organisation, rewarded with a competitive salary and benefits package as well as comprehensive training and development opportunities. The expertise and experience of our people have enabled us to become the organisation we are today. It’s what has made us the UK’s leading pathology provider and furthered our ambition to transform the way our services are delivered. The Blood Sciences Laboratory at King's College Hospital has brought together highly automated Haematology, which includes Blood Transfusion, and highly automated Biochemistry. Various Immunology and Virology investigations and antibiotic assays have also been transferred. Our state-of-the-art Blood Sciences Laboratory has been in operation since October 2006. Viapath employs world-class scientific, clinical and operational experts at the top of their game. The,deep experience of our teaching hospital Trusts, combined with the knowledge of a network of experts and access to the latest equipment allows us to continually add to our knowledge base. Our goal is to ensure that everyone at Viapath is learning from the best. The Staff Engagement Group (SEG) is a forum for open and honest sharing and discussion of news, views, ideas and feedback. They are held once a month on each site and there is one representative present from each department, and we always welcome new representatives. 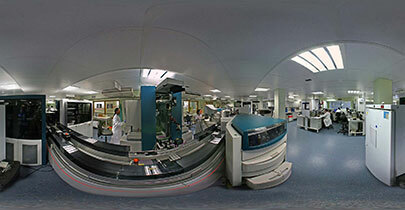 We are the largest pathology service provider in the UK. We also aim to be the most innovative, both in terms of the new tests we develop, and the way we design, deliver and seek to continuously improve our services. We regularly hold symposia that attract leading and up-and-coming members of the scientific community. As well as providing networking opportunities, the symposium includes presentations on current trends and developments. Find out more about the Innovation Academy. And our unrivalled breadth and depth of service gives us the opportunity to deliver some of the most advanced diagnostic tests available today. It also creates opportunities to provide a rich learning environment where our employees can develop their careers working alongside world-class professionals. Read papers and articles from our experts. Our staff work across a number of different scientific disciplines covering a wide range of services, giving them access to a wide range of learning opportunities across laboratories allowing them to develop an unrivalled breadth of experience. There are also exciting opportunities in our corporate team. We have a dedicated events planner who coordinates regular cross-site networking and social events, making sure that we cultivate relationships both in and outside of our day- to-day working environments. Both Guy's and St Thomas’ hospitals have gyms with qualified fitness instructors, saunas, regular aerobic classes plus special courses like yoga. Guy's also has an on-site bar and a 25m heated indoor pool. We are passionate about what we do and the role that we play in leading the transformation of pathology. We are passionate about science, because we believe that better science equals better medicine. And because we know the critical role our work plays in helping to deliver better outcomes for patients, we have put scientists and clinicians at the heart of everything we do. The combination of our teaching hospital heritage and focus on scientific innovation has taught us the value of training and hands-on development. Our employees have access to a wide range of learning opportunities across our laboratories, to develop an unrivalled breadth of expertise.